The trip between Phnom Penh and Sihanoukville is relatively painless. Here’s a round-up of the best options for 2019 (hint: we prefer private taxis) to get from Phnom Penh to Sihanoukville and vice-versa. The journey take between 4 and 7 hours. The later in the day you leave, the longer the trip will be due to traffic; around dusk it can take an hour or two just to get out of Phnom Penh. One of our favorite Sihanoukville taxi drivers. Private taxis are the fastest way to get from Phnom Penh to Sihanoukville, and usually cost between $50 and $60. In high season the prices can climb even higher. Taxis can seat four people, but be warned that they don’t usually have enough room for a ton of luggage. Most of the taxis that go between Phnom Penh and Sihanoukville are Camrys, and the drivers aren’t afraid to hit the gas. Expect to get there in around 4 hours or less, although we’d advise you to keep your eyes closed. Later departures will take longer due to traffic. You can book a taxi online in advance, and the prices are surprisingly reasonable. In fact, if you book online you can get an SUV taxi that seats five for the same price — around $60. There is also the option to book a 7- or 10-seat minivan. We also have a few taxi recommendations in our Sihanoukville City Guide, but they will need to be booked a day in advance. Most companies running the full-size buses that go between Phnom Penh and Sihanoukville are objectively terrible: unsafe, slow, and uncomfortable. The shining exception is Giant Ibis. 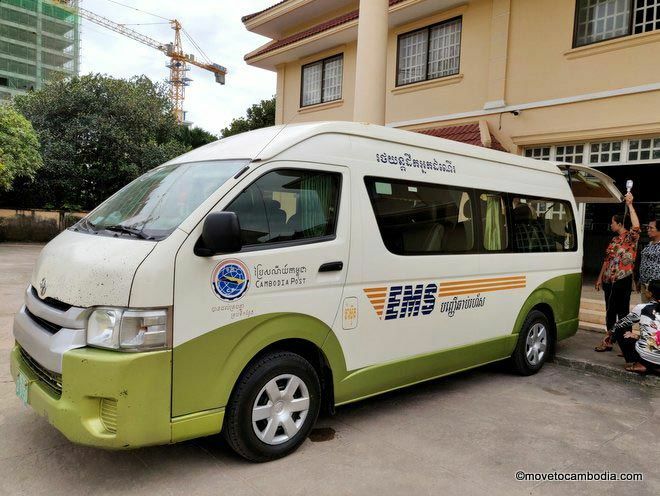 But a faster, more comfortable way to go between Phnom Penh and Sihanoukville, is by mini-bus or “VIP van.” The trip takes between 4 and 6 hours for vans and minibuses, and up to 7 hours for full-size buses, depending on traffic getting in and out of Phnom Penh. Foreigner favorite bus company Giant Ibis has started running full size, 38-seat buses on the Phnom Penh to Sihanoukville route in 2019. They are noticeably better than most Cambodian bus companies, and offer seat belts, relatively safe drivers, WiFi that works occasionally and a TV that plays English-language movies. The best part is they don’t stop dozens of times to pick up and drop off passengers and always leave on time. The bus stops once along the way for snacks and a bathroom break. Tickets cost $15 and include hotel pickup. You can book Giant Ibis tickets online in advance, which allows you to pick and reserve a seat for less than $1. Buses drop off and pick up at the Giant Ibis office and the trip takes about 6 hours. Phnom Penh to Sihanoukville: 8 a.m, 12:30 p.m.
Sihanoukville to Phnom Penh: 8:30 a.m., 3:30 p.m. The Cambodia Post van takes bags of mail, and you, between Phnom Penh and Sihanoukville. The Cambodia postal service runs passenger vans between many major cities in Cambodia (don’t be surprised to see bags of mail in the back). Cambodia Post vans are great value for money, so it’s all the more surprising what a pleasant journey they offer. Drivers are safe and courteous and when the network permits it, there is WiFi on the van. Be aware that the front middle seat (A1) is extremely cramped. Tickets cost $8 per person and can be purchased online in advance for a small fee, which allows seats to be reserved in advance. They often sell out, so book early. Phnom Penh to Sihanoukville: 7:30 a.m., 1:30 p.m.
Sihanoukville to Phnom Penh: 7:30 a.m., 1:30 p.m.
Mekong Express used to run a decrepit fleet of old Japanese buses between Phnom Penh and Sihanoukville, and before Giant Ibis came on the scene, they were the expat favorite. They’ve abandoned the buses and are now running “VIP Vans” decorated with decals of prancing horses. They have a good safety record and are known to drive at reasonable speeds. They have a two-tiered pricing policy; Khmers pay $10 and foreigners pay $12. You can book tickets online in advance (so you can reserve the best seat) for less than $1. Phnom Penh to Sihanoukville: 7 a.m., 8 a.m., 8:30 a.m., 9:30 a.m., 12:30 p.m., 1:30 p.m., 3 p.m., 5:30 p.m.
Sihanoukville to Phnom Penh: 7 a.m., 8 a.m., 8:30 a.m., 9:30 a.m., 12:30 p.m., 1:30 p.m., 3 p.m., 5:30 p.m. Shared taxis are usually 5-seater Camrys that somehow manage to hold seven passengers plus the driver. You can get shared taxis from the southwest corner of Central Market (Psar Thmei) in Phnom Penh or at the old bus station in Sihanoukville. Seats cost around $7-10 per person. You can offer to pay extra to take the front seat, otherwise you’ll be squeezed in with three or four others in the backseat. The journey take between 3 and 3.5 hours because they drive fast. Cambodia has recently restarted their train service, and on weekends you can take the train from Phnom Penh to Sihanoukville. The trip takes about 7 hours. 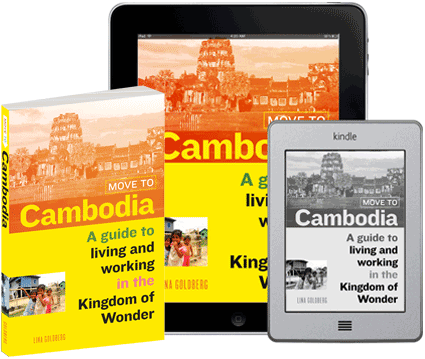 Learn more in our post about taking the train in Cambodia. If you’d like to go from the Phnom Penh airport straight to Sihanoukville, you have a few options. The easiest is to book a taxi online, in advance. The cost is $65 for an SUV taxi, and the driver will wait for you outside with a sign and help you with your bags. You can also take an official airport taxi, or catch a taxi outside for between $60 and $80, but you will need to negotiate. Another option is to arrange for any of the bus companies listed above to pick you up at the Park Cafe directly across from the airport. This much be arranged in advance and they will pick you up 50-60 minutes from the scheduled time of departure. Bus tickets purchased through links in this post generate affiliate sales for us. This does not affect our reviews for specific bus companies or routes! For more about how we deal with advertising, affiliate sales, and stuff like that, you can read more here. This entry was posted in Transportation, Phnom Penh, Sihanoukville and tagged Giant Ibis, Mekong Express, Cambodia taxi, Phnom Penh to Sihanoukville, Sihanoukville to Phnom Penh. Bookmark the permalink. I’ve tried the Mekong VIP van from Phnom Penh going to Sihanoukville and the Cambodia Post VIP van going back. Both were alright but took 2-3 hours more than what was published (good thing I didn’t pack our itinerary too tight). The Cambodia Post was 4 dollars cheaper and there were only four of us in the van initially. I thought it was a great bargain BUT after leaving the post office, the driver kept on looking for other passengers en route to Phnom Penh which caused us a lot of stops and time wasted. I’m sorry to hear that, Samirra. I haven’t had that experience, but I guess it depends on the driver. hello, still no Tuktuk application in Sihanoukville just as in Phnom penh ? Just a quick question regarding booking bus tickets online, how secure is that? 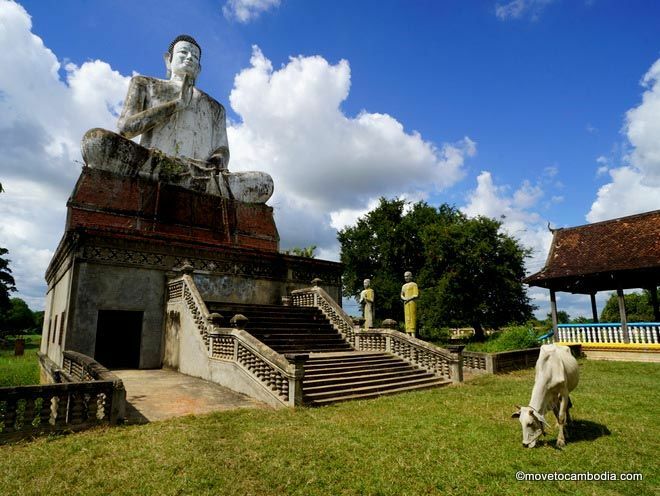 I am planning on booking my tickets for travelling within Cambodia 2-3 weeks in advance, however once I have booked my ticket what do I then need to do when arriving at the bus depot? It’s secure. You can either print out your ticket or just show it to them on your phone.